Today marks my 100th day as President of NEASO, a milestone worthy of reflection. If these few months have taught me anything, it’s that no matter how difficult the challenges, I am honored to be part of the NEASO union. And that is largely thanks to our NEASO brothers and sisters. Making connections, outreach, and seeking input from our members will remain important hallmarks of my administration. Since my first day, one of my most important goals has been to connect with our members in new and different ways. During our “Meet the Officers Brown Bags”, “Snack & Groove Committee Sign-Up” and “NEASO Committee Chairs Roundtable (NCCR)”, I could feel the excitement of veteran and new members. And I’ve gained an even greater appreciation for how deeply our members care about their union and the opportunities that exist to be engaged and advance the vision and mission of NEASO. I am excited that we are strengthening the relationship between headquarters and our brothers and sisters at Member Benefits. I can’t count the number of visits I have made to Gaithersburg to reconnect and reestablish a sense of community and unity. We need our family at Member Benefits just as much as they need us. There were many other accomplishments we should also be proud of: the ASTO MOU signing (HQ); the first General Membership vote to hire a NEASO Executive Director; NEA New Employee Orientation, where we were at the table to inform our members about NEASO, and the Stewards Training (HQ) that will happen in May of this year (MB, your training is on the way). My key take-aways during my first 100 days is that NEASO needs to enhance our communication so that everyone understands our goals and ultimate decisions, as well as how those decisions were made. I am committed to being forthcoming (as much as I can), and being accountable, as well as improve communication and dialogue for everyone. We must never forget that we are here to serve the best interests of our members and we must prioritize their interests above our own at every turn. We must handle conflict the right way and do our jobs with diligence and integrity. And make no mistake, we are not in this to be an ordinary union–we are in it to be extraordinary. “One Voice, One Sound” is so much more than a motto. It is an expectation – one for me, our members, and the leaders of this great union. While none of us are perfect, excellence should always be our goal. But to reach it, everyone must be pulling in the same direction. NEASO is calling for nominations for delegates to the 2019 National Staff Organization (NSO) Representative Assembly (RA). The NSO RA will meet on June 7 and 8, 2019 in Austin, TX. The NSO RA is an annual gathering of voting representatives from NSO’s state affiliates to elect officers, share information and set priorities for the coming year. As a delegate, you will have the opportunity to meet other NSO members from across the country, weigh in on pressing union issues, and learn more about the NSO. All NEASO members in good standing are eligible to be nominated for and elected to the RA delegation. The RA delegation will also include NEASO President Robin L Jones, HQ-Vice President Jay Hunter, MB-Vice President Zachary Reid, Secretary Lauren Mayeaux, and Treasurer Timothy Reed, each of whom was elected to serve as both NEASO Officer and NSO delegate. NEASO members will elect the remainder of the delegates by a secret ballot election on Thursday, May 9, 2019. To nominate a NEASO member for the NSO RA delegate election, complete and return the enclosed/attached nomination form by midnight on Monday, April 15, 2019. Forms may be returned by U.S. Mail to NEASO, PO Box 66806, Washington DC 20036; by Fax to (202) 822-7802; by hand to Jean Mondejar in the NEASO Office. Both nominator and nominee must be members in good standing of NEASO. Signatures of both the nominator and nominee are required for the nomination to be considered valid. 4) Nominations, as well as the acceptance thereof, are due by midnight on Monday, April 15, 2019. All nominations are due by midnight on Monday, April 15, 2019. Nominees have until Monday, April 22 to withdraw from the ballot once nominated. 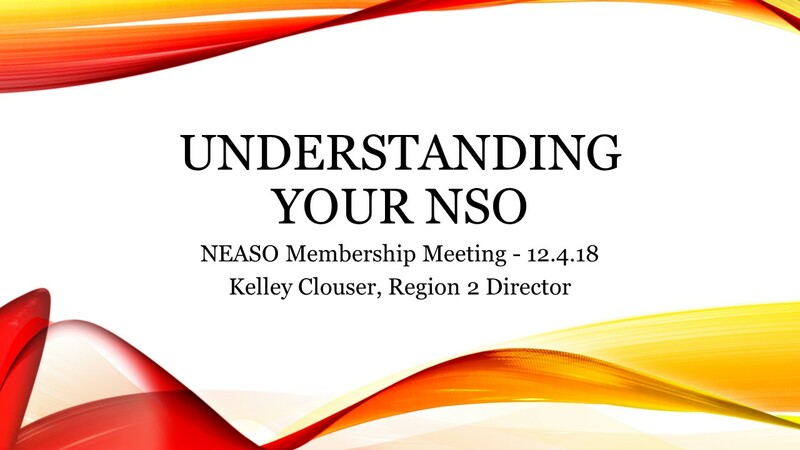 Attached is the powerpoint presentation given at our last general membership meeting by Kelley Clouser, our National Staff Organization (NSO) Regional Director. Please take a moment to review for a greater understanding of the benefits of NSO for NEASO. It gives me great pleasure to greet you as your new President! I am excited and ready to embark on this new journey with you. I hope that each of you had a wonderful holiday season with family and friends, taking the opportunity to rest, reflect and recharge as we move forward in 2019. 1. NEASO.org – Register today! Here you will find all NEASO documents including the 2018 minutes. Please note: until we move to a new membership platform, all NEASO notices and updates will be available here. We will be limiting the amount of NEASO business on the NEA email system. It is important that NEASO has your personal email address. 2. NEASO Constitution and Bylaws (C&BL) – please read and familiarize yourself with this document. It is located here on NEASO.org. 3. NEASO & NEA (HQ) 2018-2021 Contract - has been distributed to all Centers/Departments. Be sure to familiarize yourself with the negotiated agreement. If you have not received your copy, please let your Shop Steward or NEASO Officers know ASAP. 4. Center/Department (HQ) and MB Brown Bags – beginning in January let’s get to know one another and have an initial dialogue regarding unit working conditions. The schedules will be sent in the coming days. If there are any concerns prior to your scheduled meeting, do not hesitate to reach out to me. 5. NEASO Committees - there are five standing Committees (see Article XIV. Committees in C&BL) and other ad-hoc/joint committees that NEASO members can be actively involved. Please review and let us know of your interest. 6. List of 2019 Shop Stewards - attached is the latest list of approved Shop Stewards. Take the time to get to know your Stewards, not only in your immediate areas, but all others, as they are NEASO representatives. Be on alert for a future Shop Stewards/Membership meet and greet. The NEASO Executive Officers, NEASO Board of Directors, and NEASO Shop Stewards are here to serve you and respond to your needs.